Globalisation and the booming using of the Internet is driving the market in counterfeit goods, with pharmaceuticals the most targeted, according to a new report. Launched by online brand protection firm NetNames, the report – entitled The Risks of the Online Counterfeit Community - looks at the state of play in online counterfeiting and warns that no brand can afford to underestimate the sophistication of fraudsters that exploit the digital world. Pharmaceuticals are the most targeted counterfeit market, worth $200bn, followed by electronics ($169bn) and food ($49bn), it says. NetNames cited the figure that one in six products bought online is a fake, while a third of all counterfeit seizures in the EU are linked to internet distribution channels. According to the report, the internet provides counterfeiters with anonymity, virtually no barriers to entry, low overheads, easier distribution with more frequent, smaller consignments sent by mail, and fewer risks of being caught. Meanwhile, the desire by consumers to seek out big brands online, particularly at discount prices, is providing counterfeiters with a ready target audience and the opportunity to further the fraudsters' reach and potential profitability. "From unpoliced auction sites, online marketplaces and rogue websites, to illicit sales via social media and fraudulent mobile apps, counterfeiters now have more tools at their disposal than ever before," the report said. "Fraudsters can also target brands and consumers with a new range of digital weapons, such as phishing, cybersquatting, traffic diversion and other forms of online fraud." According to NetNames, there are up to 50,000 internet pharmacies in operation and about 95 per cent don't comply with laws and industry standards. Meanwhile, 90 per cent of drugs purchased online come from a different country than the website claims. The steady demand for drugs that are hard to access discretely or legitimately is fuelling the market for online pharmacies. But enforcement is difficult as websites often relaunch after being shutdown, it said. 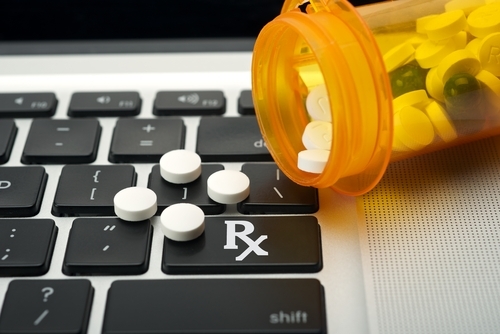 The report noted that online pharmacies can also be a gateway to financial fraud. "For some fraudsters, simply gathering financial information from customers is more lucrative than selling drugs, while others thank their shoppers for stopping by with malware or phishing attacks as a precursor to financial fraud." The popularity of consumers sourcing electronics online at cheaper prices is also driving a thriving counterfeit trade, with peer-to-peer auction sites such as eBay and Alibaba particularly attractive to counterfeiters who can remain anonymous and advertise products with relative ease. Furthermore, regulations currently do not require retailers to pre-emptively remove counterfeit listings instead relying on the rights holder to notify them first. Meanwhile, counterfeiters have been quick to harness the power of social media, and the lack of regulations, to drive sales in designer fashion brands. Here they can launch virtually zero-cost, global marketing campaigns or set up individual accounts, such as Facebook albums, as well as buy targeted advertising. Since 2010, UK complaints about counterfeit goods advertised on Facebook have risen by 400 per cent. With tobacco, counterfeiters are using online channels to drive sales such as promoting 'internet tobacconists' directly to consumers via forums, blogs and social media, and now send smaller packages directly to consumers via mail services rather than larger shipments, making them harder to intercept. While food and drink are still popular targets for counterfeiters, the report noted the Internet has a less direct role in facilitating counterfeit sales than for other goods. But online supermarket shopping is growing, particularly on marketplace platforms such as Amazon, which will likely encourage more fraudsters, the report said. The impact on brands by online counterfeiters is staggering, the report said, with brand reputations on the line. It added: "In a very real sense, today's brands are in direct competition with counterfeiters online: both are avidly pursuing greater traffic, sales conversions and profitability." The report noted that the trend of counterfeiters using the online and digital world will increase, with mobile, in particular, as the channel to watch as consumers increasingly use smartphones to purchase goods. "In this fast-changing environment, it's more crucial than ever for brand owners to manage their online presence carefully… and to develop a proactive and effective anti-counterfeiting strategy to safeguard customer confidence, brand equity, sales and revenues," the report said. What motivates deliberate counterfeit purchases?